Hungary's far-right leader Viktor Orbán is trying to force more overtime on workers. The country's trade unions are finally planning to fight back. Since its Eastern enlargement beginning in 2004, the European Union has integrated countries with almost no welfare states, weak trade unions, and labor market conditions heavily tilted in favor of capital. This has, in turn, affected European politics more broadly, helping to undermine welfare states in the Western part of the continent. One extreme example of this phenomenon is Hungary, today ruled by authoritarian, ethnic-chauvinist premier Viktor Orbán. His government combines paleo-conservative nationalism with neoliberal economic policies undermining workers’ conditions. Yet this has also sparked flashpoints. 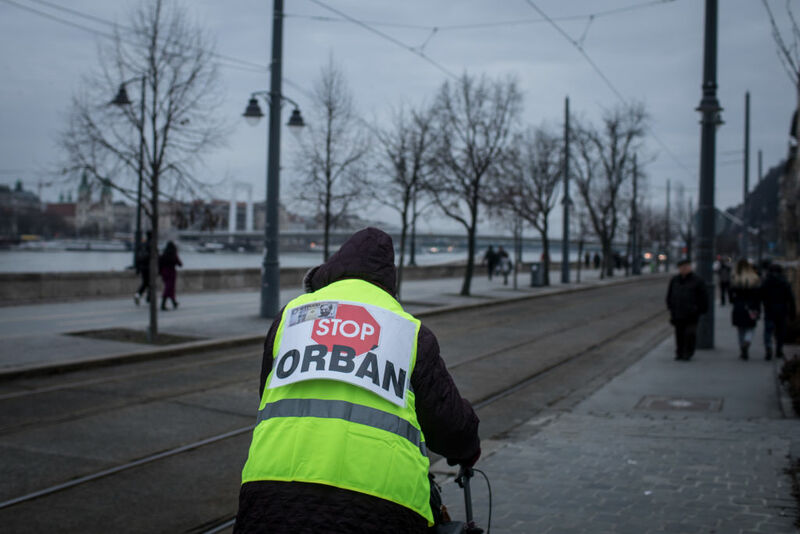 Orbán’s moves to impose more overtime on workers have in recent weeks sparked the biggest mass protest movement his government has faced; today trade unions are promising a general strike if the measures are not repealed. This would be an unprecedented move in the central European country’s recent history, in a context of low and declining union membership. Yet the fight against Orbán’s so-called “slave law” is also a historic opportunity for Hungarian labor to reassert its power. Orbán’s move builds on his predecessors’ past efforts to extend overtime. Already during the early 1990s transition from “actually existing socialism” to neoliberal capitalism, Hungarian workers could be made to put in up to 144 hours of overtime per year. Since then this limit has continually been loosened by governments of all political stripes, notwithstanding the labor-saving that has resulted from automatization and technological advances. Intensifying this tendency, on December 12, 2018, Orbán’s government adopted a new law that allows corporations to demand four hundred hours of overtime per year (up from 250), while delaying payments to workers for up to three years. The law, popularly dubbed as the “slave law,” was adopted without prior consultation with the trade unions and has been met with protracted resistance from broad sections of society. The trade union leaders believe that the law was part of a hidden deal with German car manufacturers, who fear a lack of skilled workers in a country suffering from a deepening labor shortage. Orbán has himself defended the law by claiming that employers had asked for it to be adopted. However, not a single firm has come forward saying that they did this. Orbán has also asserted that it will benefit workers, enabling them to earn more, and that it will dissuade them from seeking jobs in Western Europe. The prime minister’s main problem seems to be that, apart from the most committed state officials, the hired parrots of the state media, and the most hardline supporters of the ruling Fidesz government, virtually no one seems to agree with him. A recent survey by Policy Agenda showed that 83 percent of the working-age population oppose the slave law. Talk of a labor shortage might sound strange to readers from Southern Europe, whose countries have been facing high unemployment (especially youth unemployment) for more than a decade. But in the so-called “Visegrád” countries (Czech Republic, Hungary, Poland, Slovakia), which constitute Germany’s economic hinterland, the problem is the opposite: there is a shortage of labor. One of the main reasons for the growing labor shortage in the region is that many workers have migrated to the more “advanced” capitalist states in Western Europe, in search of better living conditions. While this process already began following the regime change in 1989, it intensified after the 2008 global economic crisis, which hit the post-socialist economies harder than the rest of the world. In the case of Hungary, some 350,000 workers (8 percent of the entire workforce) have moved to the West in recent years, in particular Austria, Germany, and the United Kingdom. Their remittances now amount to 3 percent of GDP, a net inflow which along with the 6 percent of GDP represented by EU cohesion transfers has helped underpin Hungary’s economic “recovery” under the Orbán regime. It would difficult to call this a success story, given that Hungary is averaging 2.2 percent economic growth based on this 9 percent net inflow of external resources. But the emigration of Hungarian workers to the West has also given rise to an increasingly pressing labor shortage, especially regarding skilled workers. In a June 2018 Eurostat survey, 86.6 percent of Hungarian industrial employers complained that they were suffering from a shortage of skilled labor. A second reason for Hungary’s labor shortage is the employment effect of EU Cohesion Policy transfers. In Hungary, these labor-intensive infrastructural investments are believed to account for some 170,000 jobs. On top of this, the government has run large-scale public works programs, employing between 200,000 and 220,000 workers. While these programs have improved unemployment statistics, a reliable study by the Hungarian Academy of Sciences argues that many of these jobs are pointless, and merely a case of moving workers from one form of unemployment to another. Added to this are the structural inequalities caused by the inflow of foreign investment. One notable example is the auto industry, where Hungary has become somewhat of a regional “poster boy.” Since 1989, car manufacturing has become one of the pillars of the Hungarian economy. By 2007, revenues from the sector amounted to €15.4 billion (more than 15 percent of GDP). The largest foreign investor is Audi, which has been present in the country since 1993, constructing one Europe’s largest manufacturing plants in the northwestern city of Győr, while Mercedes opened a new manufacturing factory in the southeastern city of Kecskemét in 2016. And last year, BMW announced its decision to invest €1 billion to build a new factory near the north-eastern city of Debrecen. Together with suppliers, the car industry employs some 270,000 workers in the country. With this, Hungary is closing in on Slovakia, the largest per capita auto manufacturer in the world, and not far behind the Czech Republic. Most of what takes place in these countries is low-wage assembly work, as outsourced phases of (mainly German) transnational production chains. Since 1989, German capital has invested heavily in these countries because of their geographical proximity to core European states, extremely weak trade unions, and relatively low labor costs (currently, wages in the Visegrád countries are one-quarter of German levels). In addition, Prime Minister Orbán, who frequently publicly rails against German “economic colonization,” has given German corporations (from Audi to Mercedes and BMW and beyond) more direct government subsidies than any other previous Hungarian government. He has also signed “strategic partnerships” with multinational corporations, such as Coca-Cola, General Electric, and Microsoft, the contents of which have been declared a state secret. While such foreign investment has soaked up what remains of the skilled labor force in the center and the east of the country, many are worried that it might not be enough. Hence the trade unions’ conviction that it was the German car manufacturers who asked for the introduction of the slave law. And they might have a point. Although neoliberal commentators often claim that capitalism and democracy go hand in hand, investors been unbothered about the authoritarian slide in either Orbán’s Hungary or Jair Bolsonaro’s Brazil (to mention only two glaring examples), as long as it does not harm their profits. In fact, Orbán’s slave law is probably music to the ears of many foreign investors, since they know that similar laws would never be adopted in more advanced welfare states, such as Germany. This said, it should be noted that the Hungarian economy would not be struggling with a labor shortage in the first place, if the Orbán regime had financed the educational and health care sectors properly. However, instead Orbán has opted to pursue neoliberal austerity for the masses (since 2010 government spending on education and health care has fallen substantially, whereas spending on social protection — already below the EU average prior to Orbán’s return to power — has been dwindling), while promoting the enrichment of a small, loyal class of domestic capitalists. The consequence has been a dire depreciation of the human capital of a country that had once prided itself for its brains and skills. The parliamentary opposition, ranging from the once-fascist and now national-conservative Jobbik, through the Socialists (MSZP), to the tiny green (LMP, Párbeszéd) and liberal parties (DK, Momentum), has been united in its attempts to block the passing of the slave law. Amid chaotic scenes in Parliament, debate was cut short, causing opposition MPs to exit the building and call a series of street demonstrations. Tens of thousands showed up in Budapest, and in smaller demonstrations across the country. However, these are now beginning to run out steam, with protesters calling for a national strike. This has placed enormous pressure on the trade unions, who have signaled their willingness to call for a national strike. This, however, is easier said than done. Trade union density has declined from 44 percent in 1995 to just 9 percent today, which is way lower than the Western European average of 34 percent, itself down from 45 percent in the same period. Scandinavian numbers are even higher, but Hungarian figures are similar to those of the other Visegrád countries. At the same time, there is also a relative lack of experience of strike action. Hungary has not had a general strike since the revolution of 1956. Hence, perhaps unsurprisingly, a large number of workers are not even familiar with the idea of such an action. In sharp contrast to Southern Europe, the post-socialist countries of the European Union do not have a history of militant and effective trade unions. Following World War II, the trade unions effectively became rubber stamps of the local Communist parties, and they have not been able to build any real strength in society since the neoliberal transformation. One joke compares the unions to the biblical “Adam’s bellybutton.” No one really knows what it’s for, but you’d miss it if it wasn’t there. Yet in recent years trade unions have gathered steam. Many unions have replaced their corrupt leaders with new ones. This new generation has organized wave of successful strikes, leading to significant wage increases. As a consequence, the average real wage in Hungary has been rising at 4-5 percent annually for years, while there was a 15 percent rise in the minimum wage last year. These developments have proved wrong the neoliberal mainstream of the economics profession in the country, who had been worried as always about the possible employment effects of the continued wage rise. The labor market situation actually even improved, with rising domestic demand due to higher wages playing a significant role. Now, in the buildup towards a national strike, Hungary is also witnessing local actions. Workers at the Mercedes plant have already won themselves a 35 percent wage increase, while Audi workers are currently on strike for a 18 percent increase plus other benefits. The public sector unions have also announced that they will hold a national strike, if the government does not repeal the slave law (although the strike would only be held on March 14, nearly two months from now). Union leaders all agree that each time action is declared, membership increases. Their colleagues in the Czech Republic have similar experiences. Passive trade unions shed members, while active ones gain new ones. Perhaps Adam’s bellybutton will have some use after all. Zoltán Pogátsa is the head of the Institute of Economics at the University of Western Hungary.